So recently on a work project, there was an issue with one of our schedules. One of the partition schedule rows would not populate the partition information. Someone created a wall type D03R in the project with information you would typical find in a wall (Width, Framing Width, Fire Rating, SRC Rating, etc.). Additionally, in my office, we have project templates that automatically populates the schedules when you place a wall in the model, so the architect working on the schedule wasn’t familiar with the settings of the schedule. When I examined the schedule, I noticed the wall type D03R showed up but none of the additional fields populated. This perplexed me for a moment and then I realized the issue, there was another wall type in use with the same type mark. 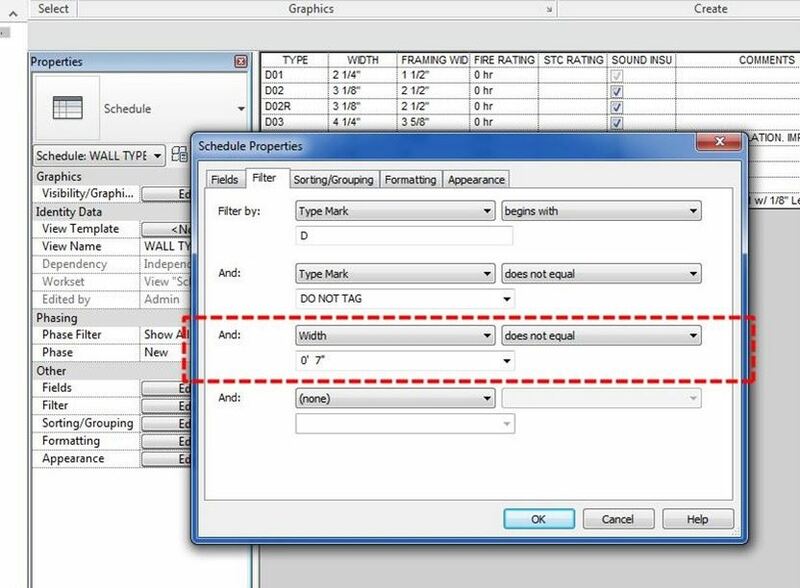 Since there were two walls with the same type mark, Revit couldn’t populate the field because it couldn’t reconcile what information to display. Hence the tell! Once I figured that out, I was able to remedy the situation by setting a filter to target the wall type we wanted. While I didn’t know initially, this was Revit’s way of telling us of an issue. Since it couldn’t populate two types of information in one row, it chose to leave it blank until we addressed it. While this issues was in Partition Schedules, the logic and procedure applies to schedules in general, since they report information. Wall type D03R was not populating information like the other wall types. We filtered a wall schedule by type mark D03R and determined there were 2 families in place. We determined that we didn’t need the other type in the schedule and filtered by the Width of 7″ because it was unique to the other wall type. ← Revit Rooms – So powerful and you need to know!